The avid pomegranate munchers among you will know all about its most attractive attribute; the way its ruby red jewels burst with a flurry of sweetness onto the palate. But I’m also a prominent advocate of the lesser-known, and used, pomegranate molasses. Rich and syrup-like in its consistency, a tablespoon in any salad gives it a sharp sweetness, similar to a balsamic reduction. There’s little more to say about what is an incredibly simple “salad”. It can be to you whatever you’d like it to be; an inexpensive and easily prepared lunch for a weekday, or a side for dinner alongside a hearty portion of falafel and flatbread. But however you enjoy it, be sure to do just that. Bring your Israeli couscous to the boil according to its packet’s instructions. Be careful not to overcook the couscous, as it should be al dente. Drain, rinse and set aside. 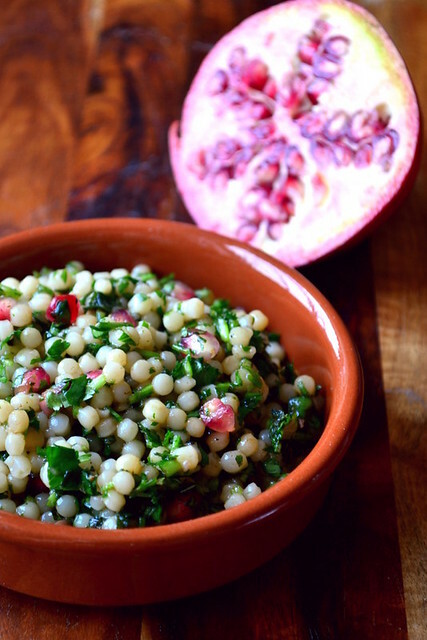 In a large bowl, mix together the lemon juice, olive oil, molasses, parsley and coriander. 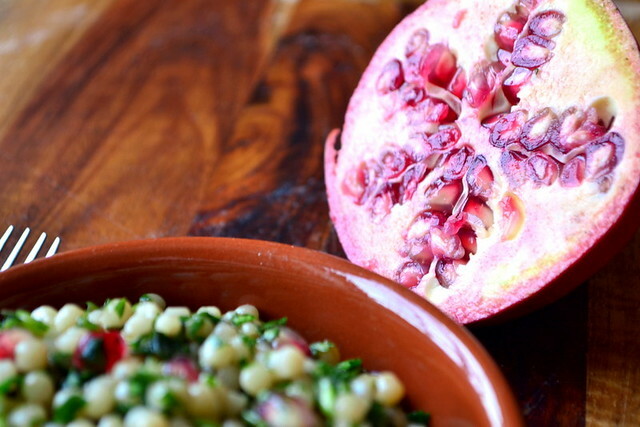 Extract the pomegranate seeds from its husk and add to the bowl. Bring the couscous and other ingredients together in the serving bowl and season to taste. Cost: The key here is simplicity. 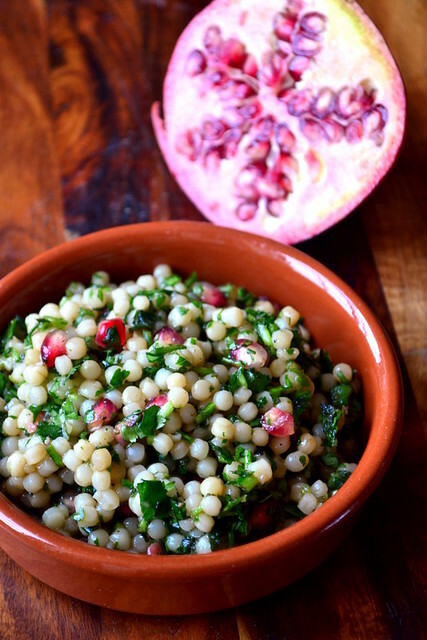 Pomegranate isn’t the cheapest of fruits, but you need relatively little to achieve the sweet punctuation of flavour it brings to a dish. Ultimately, it’s difficult to argue with £1.65 for a sizeable and tempting “salad” like this. Please keep sending me e-mails. I love pomegranate. 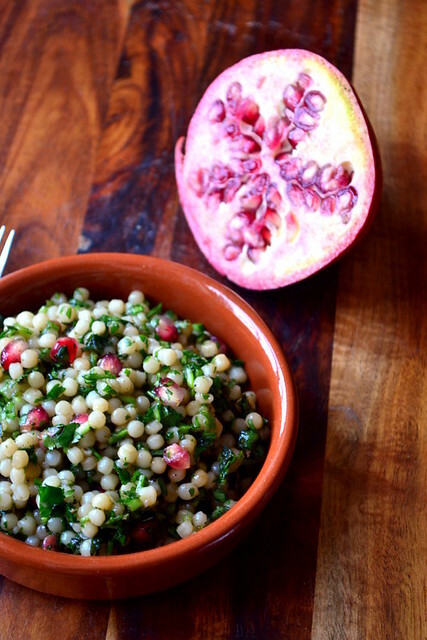 I bought some pomegranate molasses a while ago but haven’t know what to do with them so thank you for this recipe which I can’t wait to try! I made this this evening for dinner – wonderful! Had it with lamb. Will definitely make again. Pomegranate seeds can be found frozen at Iceland, much cheaper and you don’t need to spend half your day bashing fruit with a spoon.